HP Indigo 7600 Digital PressThe Dutch print company, VG Print B.V., has announced the installation of the first non-beta HP Indigo 7600 Digital Press in the world. The company says it made the investment to bolster its digital production capabilities. VG Print has a diverse customer base of small and large companies and just under 50 per cent of its business is as an out-sourcing provider for print buyers and agencies. HP have confirmed that the new press can print at speeds up to 120 four-colour A4 pages per minute (ppm) and up to 160ppm in Enhanced Productivity Mode - a 33 per cent increase over the previous top speed for presses in this series. They also pointed out that the press can handle 2500 certified substrates and generate special effects, two of the value-adding features that VG Print will benefit from. VG Print started life as a commercial printer with digital dry toner press capabilities in 2005. In 2008 it installed an HP Indigo press 3500 to enhance print quality. In line with many of to-day's print service providers (PSPs), it also saw the opportunity to become a one-stop-shop for all its customers' print requirements, and decided to add a wide format capability, including an HP Designjet 5500 Printer. "Our digital business has grown steadily and now comprises about 70 per cent of our business," said Rob Ebben, managing director, VG Print B.V. "Since we are optimistic about the future, we decided to increase our digital production capabilities. We particularly liked the Indigo 7600 Digital press's runability and the broad range of substrates that it can print." VG Print’s product offering includes business cards, flyers, brochures, periodicals, books, labels, envelopes, posters, banners, and vehicle wraps, one of the reasons it has attracted such a varied customer base. 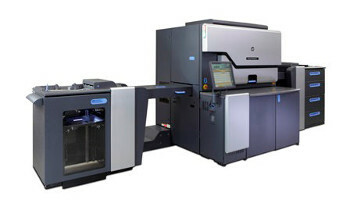 HP confirmed that the company used HP Financial Services (HPFS) to buy its new five-colour HP Indigo 7600 Digital Press. "Once we decided to buy the press, HPFS contacted us and made us an offer," Ebben explained. "They organised a package that enabled us to buy the press while preserving our cash flow, thus reducing the risk." VG Print, which now employs 10 people, is keeping its original HP Indigo press 3500 to provide overflow and backup capacity. "We've been very pleased with the service and support we've had from HP," said Ebben. "Still, we looked carefully at the alternatives before coming to the conclusion that the HP 7600 press was the right one for us. Our customers often specifically request HP Indigo quality, so the HP Indigo 7600 Digital Press made sense for us."